Homeopathy is a system of medicine that uses remedies made from natural substances to stimulate the body’s innate ability to heal itself, restoring the body to its original optimal function and vitality. Homeopathy treats the whole person, both physical and emotional, and has the potential to cure most chronic and acute ailments, ranging from depression, hyperactivity and anxiety to sore throats, food poisoning and morning sickness. Homeopathic remedies are safe, gentle and effective and suitable for infants, children, and adults. Homeopathy is alternative health care for a lifetime of wellness. Homeopathy was developed over 200 years ago by the German chemist and physician, Samuel Hahnemann. He based the system of homeopathy on a long-established law of cure that states “like cures like.” Simply put, this means a substance that creates symptoms in a healthy person will cure the same symptoms in a person who is sick. For example, the remedy Apis is made from a bee and is very effective, on an acute level, in treating bee stings and sting-like symptoms. It is very common to get redness and swelling with burning, stinging pain from a bee-sting, so it follows homeopathic principles that the remedy Apis cures those same symptoms (“like cures like”). If you have redness, swelling and burning, stinging pains, from any cause, administering Apis will remove the symptoms, rendering you pain-free and causing the redness and swelling to disappear. Apis is a common remedy for sore throats, allergic reactions and cystitis – when Apis-like symptoms are present. On a deeper level, Apis also treats a deep mental picture of restlessness, busyness, jealousy and being hard to please (imagine a queen bee). A remedy’s ability to treat myriad symptoms on many levels is truly elegant. 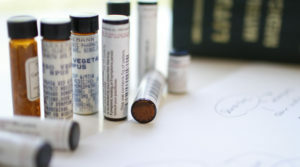 Matching a client’s symptoms to a specific remedy’s curative powers is the heart of homeopathic practice. Homeopaths treat clients with an open mind, respect and compassion, a state we call the “unprejudiced observer.” This creates a safe and nurturing environment, and forges the foundation of a trusting relationship between client and practitioner. Homeopaths are keenly interested in all areas of a clients’ life and history; physical, mental and emotional. We ask for detailed descriptions of all symptoms, past and present, and then go further, thinking deeply about why a person acts the way they do, what is the pattern of their life, and what restrictions are present. After careful analysis, a homeopathic remedy is selected that shares a pattern that has a very close similarity to the client’s state. This is called the “simillimum,” it is the most similar remedy for each person. Like the bee remedy acting on the sting-like symptom, this specifically chosen remedy will remove unwanted symptoms and restore health and vitality. All of us are born with an innately intelligent and sophisticated system to keep the body balanced and healthy. Homeopathic remedies act as a catalyst to stimulate this intuitive intelligence, what we call the vital force, to balance and strengthen the body, to keep it healthy over the long term, and to resist further disease. In his book, the “Organon”, Hahnemann’s initial statement is that the homeopath’s “highest and only calling is to make the sick healthy, to cure.” This is the cornerstone of the homeopathic practice. By bringing together our knowledge of a person through compassionate observation and dialogue and our knowledge of remedies through study, homeopaths are able to choose an appropriate remedy that will stimulate the body’s innate intelligence and allow it to bring about a cure, restoring health from the deepest level.